Monday, what elements make up the core? Tuesday, name the layers of Earth and one fact about each. Wednesday, Which of the following models would best represent the inner and outer core of Earth, based on the physical characteristics of each layer? Thursday and Friday, Which of the following best describes Earth’s asthenosphere? Monday, students were reminded of their 3-D model of the earth that’s due this Friday, 29th. It’s a summative grade. Click on this PDF for details, Build a Model of the Earth. Afterwards, students began working on this PDF called layers of the earth foldable. They’ll finish it in class tomorrow. To assist in finding out the information use the Structure of the Earth Resources found on my Google Classroom and/or the picture below. In my Google Classroom, open the only PDF link. Towards the end of the PDF, a picture of a completed foldable is visible. This foldable will help with the model and a formative that’ll be given this Friday. Tuesday, students finished up making their foldable and then watched this short video clip, Earth’s interior isn’t quite what we thought it was. Wednesday, students are wrapping up layers of Earth. We watched this fun video clip Earth’s Layers. Afterwards, they read this article Rdg Science: Layers of the earth and created some notes in their notebooks about each layer based on the article. Then we discussed their findings. Using the graph above, what is the most significant way to decrease energy consumption in a household according to the graph provided? Keep the refrigeration door closed as much as possible to avoid letting cold air out. Tuesday: Some renewable energy resources produce more energy at certain times of the day or year. Which combination of energy resources are renewable resources that can produce a steady flow of energy 24 hours a day, year-round? one object is less dense than the other. both objects are in physical contact with each other. one of the objects is made of a metal. both objects are exactly the same temperature. Friday: In an investigation a student places a frozen ice pack inside a beaker of hot water. The student records the temperature of the water over a time of 5 minutes. What observation is the student most likely to make and why? Cold will transfer from the ice pack to the water through radiation decreasing the temperature of the water. Thermal energy will transfer to the hot water through convection and it will increase in temperature. Cold will transfer from the ice pack to the water through conduction decreasing the water’s temperature. Thermal energy will transfer from the water to the ice pack through conduction decreasing the water’s temperature. Monday- students took their energy resources DCA, a formative. Tuesday- students took their energy resources summative. Wednesday, students learned how they did on both assessments above. Afterwards, we began our new unit watching this clip called Heat by StudyJam. Afterwards students began making their GKW for this unit. These words & definitions are found on my Google Classroom as a Quizlet. This Friday, students will be have a quiz over them and they’ll be able to use their notebook in which these GKWs are to be written. Thursday, students began and will finish tomorrow a fold-able, convection, conduction and radiation (see below). Students also received a homework assignment: Reading Science- Convection, Conduction and Radiation. See Google Classroom to download, if needed. Tuesday, begin working on their GKWs in prep for this Friday’s quiz over them. reservoirs can be used for irrigation of crops. may divert water and alter normal water flow. might disrupt the movements of migrating salmon. sometimes causes flooding in surrounding areas. forms in a short amount of time. is abundant over a wide area. Thursday: Natural gas is a fossil fuel formed within oil fields and coal beds. What is an advantage of using natural gas as an alternative form of energy? Friday: A student was asked to give the disadvantages of using biomass as an energy source and stated that there are no disadvantages. Which of the following best evaluates the response of the student? Tuesday, students watched this cool animation, introducing the topic of energy resources transforming into electricity. They were taught how to use my links under Energy Stuff found on my Cool Science Sites of this website. They began learning some advantages of converting fossil fuels into electricity. Wednesday-Friday, students will be given time to research the advantages and disadvantages of the resources used to provide usable energy. They are the resources mentioned in the goal of the week. To find a completed list of advantages and disadvantages go to my class notes/handouts/resources page. Under Energy, it’ll be posted. Thursday, complete the advantages and disadvantages for each resource for tomorrow. Weekend, study the advantages and disadvantages info for the Energy Resources DCA on Tuesday, 15th summative. Underline the examples of physical & chemical properties. Underline the question you should ask to determine if a physical or chemical change has happened? Underline the signs of a chemical change? tuesday: demo #3: baking soda+vinegar combined, physical or chemical change? Prove it! 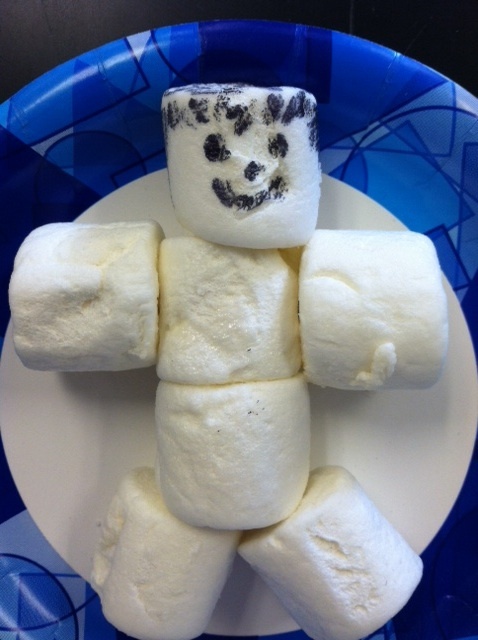 Monday, students had fun with Melvin the Marshmallow Man Lab. This is a formative grade. For each reasoning, they’re to write include the action performed on Melvin, identifying the change and evidence for this change. If students don’t have enough room on the front to do this, they may use the back of their paper. This is due Wednesday, 28th. 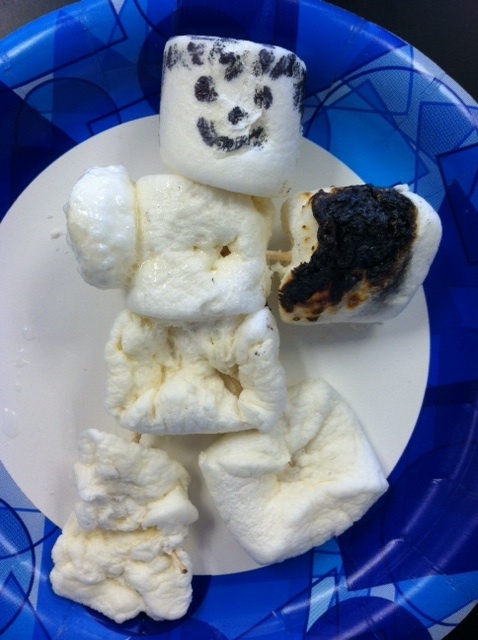 Tuesday, students reviewed the signs of a chemical change as we discussed the demo. Afterwards, students were given time to work on their Melvin lab that will be a formative grade to be turned into me tomorrow. Tuesday, complete Melvin Lab for tomorrow. This is a formative grade. Monday:Before going to school, a student cuts a ripe apple into six slices and places them in a plastic bag. During lunch, the student observes that the apple slices now have brown spots. Which of the following indicates a chemical change in the apple? Tuesday: Define chemical change and physical change. A chemical change is when chemical bonds of molecules are made or broken in order to create a new molecule. This type of change is typically difficult to reverse. A physical change is when molecules can move from one physical state to another (phase change) and not change their atomic structure. This change is typically easy to reverse. Wednesday: students watched a demo of water and blue food coloring being mixed and needed to decide if it was an example of a physical or chemical change and explain why they chose. Afterwards, they needed to decide if mixing bleach into the water and food coloring was a physical or chemical change and why. Monday, students were given their scores from Friday’s density summative. Retakes are to be completed by Monday, 26th of October. Reteach times with me are tomorrow and Friday after school till 4:20. Students can retake the test with Mr. Alexander in the morning on Tues, Weds. and Friday of this week and Monday upon return from Thanksgiving break; after school with me on Tues. and Fri of this week; or during advisory on Thurs. or Fri. of this week. They were given time to work in their notebooks, recording the words and definitions of this units’ GKWs. They’ll have a quiz over them this Friday. Most likely they’ll not be able to use notes. Tuesday, students watched a StudyJam, found on my Google Classroom and a BrainPop on Physical vs Chemical Changes. After watching BrainPop, students completed some simple notes also found on Google Classroom. Finally, students were given their homework, Physical and Chemical Properties and Changes. The first 30 problems are due tomorrow. This too is on my Google Classroom. The entire page, front and back are due this Friday for a daily grade. Wednesday, after the warm up and the discussion that followed, we went over their homework. Finally, students worked with their shoulder buddies and identified about 20 examples as either physical or chemical change. They recorded their data in their notebooks. We’ll complete the activity tomorrow with follow up questions. Monday- Thursday: prepare for Friday’s formative over the GKWs. Tuesday- Physical and Chemical Properties and Changes, 1-30 due tomorrow. Wednesday- complete part A and B on the Physical and Chemical Properties and Changes, due tomorrow. matter, how dense is it? Monday- Use the table below to identify the substance with this information: the sample is 44.3g and 22.1 cm3. What’s the sample and its density? Tuesday: Using the table above, this sample has a mass of 1.02g and volume of 1.35cm3. What’s its the density and the mineral? Thursday: An object is 12g and has a volume of 3cm x 2cm x 4cm. What’s its density? Monday: students wrapped up discovering the physical properties of their irregular shape. They were learning specifically how to use water displacement to find the volume of these shapes. Then they’d use this to help them calculate the density of these 5 shapes. Afterwards, we discussed the activity and began to review for tomorrow’s DCA over density. Tuesday, students had fun reviewing for their DCA using the Amazing Race format, working in teams to solve density problems. Thursday, students went over their DCAs and learned their score. Afterwards, they had fun reviewing for tomorrow’s summative using the Amazing Race. Friday, students took their Density Summative. matter, how dense are you? Tuesday, The density of water is 1 g/cm³. A substance will float if its density is less than that of water. Which of the following substances will float? What’s the density of the substance that will float? Monday: After the warm up and introducing our new unit, How Dense is It? We went over Friday’s summative, It’s Classified: elements, compounds, metals and more. The deadline for retaking the summative is Monday, Nov. 5th. My reteach day is Tuesday, 30th after school. Retakes can be made Weds.-Mon. during lunch, after school on Weds. or Fri., or during advisory on Thur. or Fri.
Tuesday, students watched a BrainPop, learning from Tim and Moby what density is and how to calculate it. Afterwards, they were given a Fill in the Blanks Notes for finding Density. They glued them into their notebooks for reference. Wednesday- Thursday Students were given several cubes made of various substances. They worked as a team to find these physical properties of the cubes: mass, volume and density. They recorded their findings in their notebooks. Finally, they were given a table of substances that were used to make each cube and it’s density. Using their data and the table, they were able to identify the cube’s substance. Friday, students continued to build their knowledge of calculating density using irregular shapes. They watched this fun Ted Talk, How Taking a Bath Led to Archimedes’ Principle. Afterwards, they were given some irregular shapes and time to find their densities. They’re recording their discoveries in their notebooks. They’ll finish this up on Monday, 5th.